I came home from work yesterday to find a large Amazon parcel waiting for me. 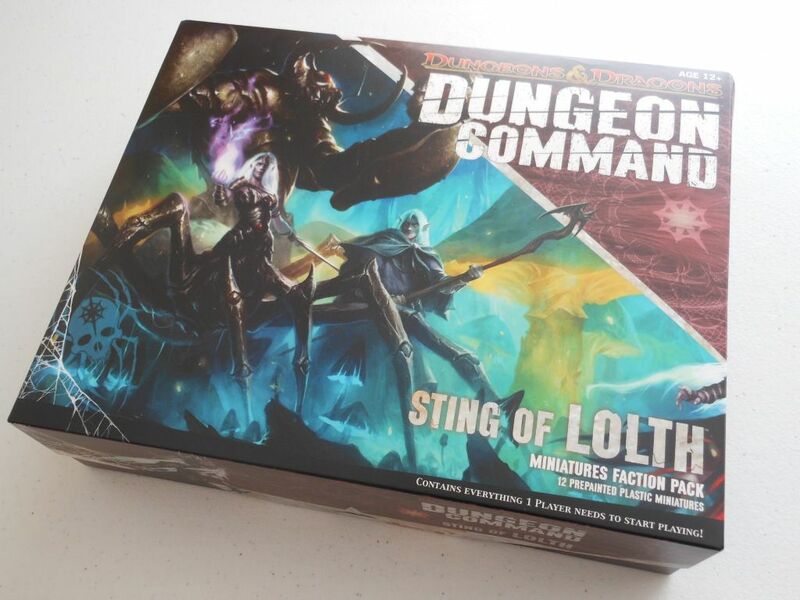 It could only mean one thing: my preordered copies of Dungeon Command: Sting of Lolth and Dungeon Command: Heart of Cormyr had finally arrived. These are the "faction packs" for the new skirmish level miniatures game from Wizards of the Coast. Each pack contains 12 miniatures and all the cards and boards needed for one person to play the game; so of course, I had ordered both packs (how else am I going to play the game against my wife?). Each pack also contains some cards so you can use the miniatures in the Dungeons and Dragons Adventure System games (like Wrath of Ashardalon); but as I don't own any of those games, I couldn't give a monkey's. Tearing into the packaging, I was presented with two rather beautifully illustrated boxes. I had already read somewhere else (probably over on www.BoardGameGeek.com) that the boxes are like the kind you see doughnuts being sold in, and that's pretty accurate. They are flimsy, with a hinged, folding top. When closed, they are sturdy enough for what they contain, but you certainly wouldn't want to stack anything on top of them. I am assuming Wizards of the Coast expect you to chuck out the boxes and store your miniatures in some other way; but I'll be damned if I'm doing that. The only boxes for games I have ever chucked out were the boxes for my Navia Dratp starters, and I really regret it. Dungeon Command: Sting of Lolth - spidery. 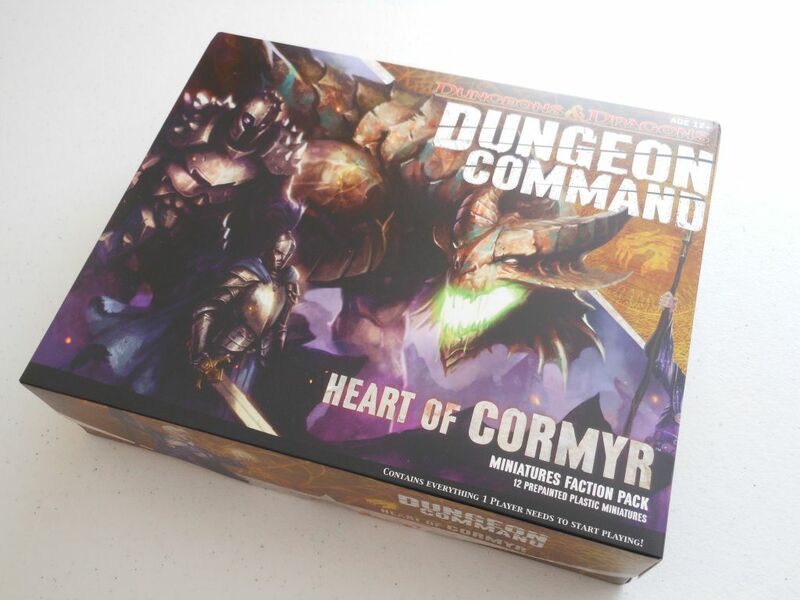 Dungeon Command: Heart of Cormyr - dragony. Unfortunately, once the boxes were opened, I have to admit to being underwhelmed by the contents; it seems that for every thing that has been done right, there is a negative to counterbalance it. I really liked the rulebook: It is printed on thick, matte paper so you don't get annoying glare from overhead lights during play. It also seems well laid out, detailed enough without being tiresome, and has lots of illustrations and diagrams. There are two types of cards: Those that show the creatures in your faction (used to show special abilities, statistics, and for tracking wounds), and those that show orders you can give to your creatures. They are all beautifully illustrated (if you can call pictures of fat, giant spiders beautiful), and the layout of the creature cards is great. When designing cards that are used in association with a playing piece it is important to make it so that you can easily tell which cards represent which models. You can do this by using a picture of the model, or you can use an illustration which shows the character in the same stance as the model. If you don't do either of these things, then there will be in-game confusion. Wizards of the Coast have got around this problem with a rather wonderful solution: The top part of the card shows a lovely piece of artwork, usually depicting the creature in action, and then in the bottom right of the card there is a small photograph of the model. This means you can have dynamic artwork while avoiding any possible in-game confusion. Top marks. Unfortunately, the cards are a little on the thin side. They are not the worst cards in the world, but I have definitely seen much better. The sheet of punch tokens are perfectly serviceable, but it looks like they have included enough treasure chests, wound markers, identifier tokens and morale/leadership trackers for two war bands. It's almost like, when the punch sheet was designed, the intention was that this would be a self-contained game with all the pieces needed for two players to fight; but somewhere along the line someone went, "Hey, you guys, we can make these tools buy this game twice if we take out one of the armies." I'm probably wrong; I'm probably being unfair to the designers; but hey, this is my blog! Each box contains two large and two small boards which you build together with another set of boards from a second "faction pack" to create the arena. The boards are double-sided, and they look great; but there are two issues. First of all, the little symbols that indicate difficult or hazardous terrain are quite faint and can be difficult to see. 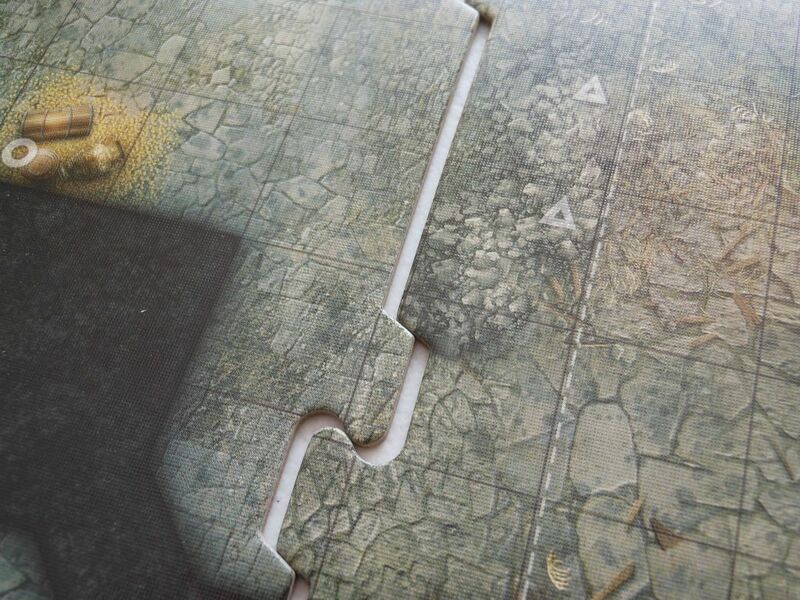 However, the bigger issue is the way the jigsaw edges fit together. The game board - gappy. The boards are by no means a snug fit. Why? Is this some kind of production error, or were Wizards of the Coast worried we would mash the boards up trying to fit together the jigsaw pieces? I don't know about you guys, but I've been building jigsaw puzzles since I was about six months old; is it too much to ask for a snug fit? (as the actress said the bishop). Okay, okay. I'll get the main event: The pre-painted miniatures. I am a painter, but I am also a father and husband with two jobs, a blog, and a shelf of games I would like to play every now and again. So, while I can paint - and do paint - I am always happy to buy something with pre-painted pieces. I know they will not be up to the standard I could do myself; but even half-decent is good enough for me. 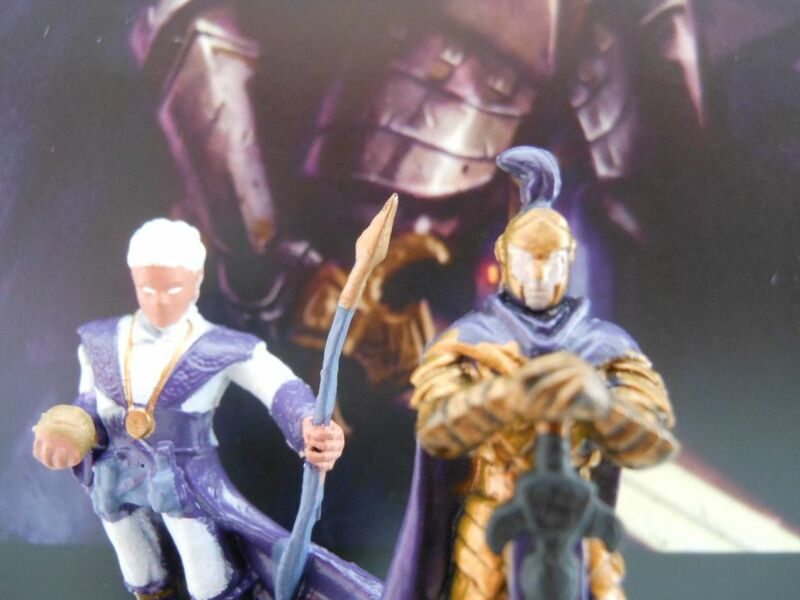 Unfortunately, Dungeon Command sports the absolute worst pre-paints I have ever seen. The paint that has been used is very watery, and has run into creases where it shouldn't; and paint has been slapped on so hurriedly that I have some pieces with cloaks the same colour as their armour. My Cormyr War Wizard looks like Mike Myers from Halloween. Bad pre-paints - note gold paint on the cloak, and NO FACE! As a comparison, I own Claustrophobia, Mage Knight: Board Game, a shedload of Lord of the Rings: Tradeable Miniatures Game, Transformers Armada, and I have experience with Heroscape, Heroclix and the Alien vs Predator Horrorclix pieces. All of the aforementioned games have pre-paints which are a hundred times better than what you get in the Dungeon Command game. This is not the end of the world: Bad paint is better than no paint, and from a distance the miniatures look fine. Up close, they might make you a bit sad. However, not all the paint jobs are terrible: I have a very nicely done dragon in the Cormyr set, and a decent Umber Hulk in the Lolth set. Here's a picture of the dragon. 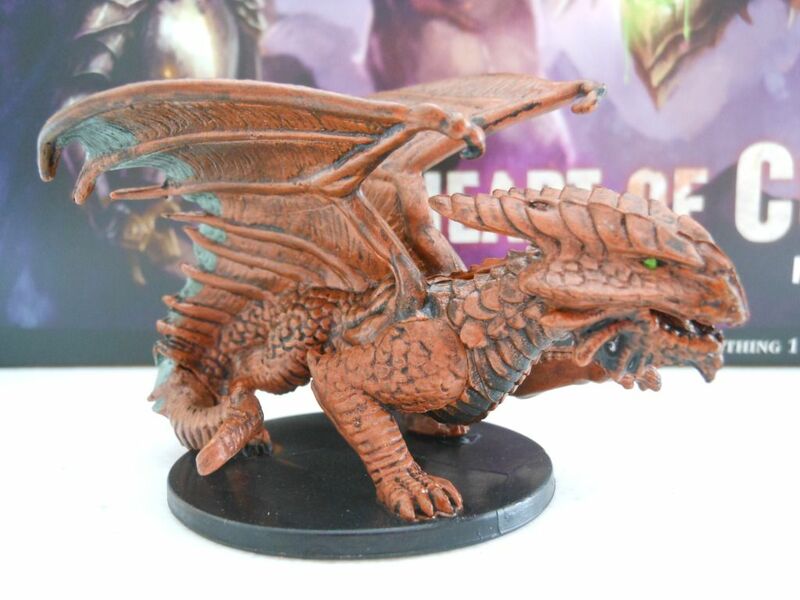 Copper Dragon from Heart of Cormyr. Now I'm off to play a few games. Expect a review at some point (covering basic game rules) and then probably a review of each "faction pack" (if I can be bothered).